Login or register (it's free) to send macolsen a private message. 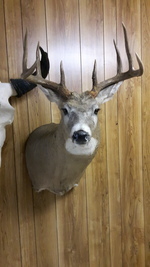 Another trophy for the wall Here is the second white-tailed buck that will be going on my wall in the future. The taxidermist did an outstanding job, as always. I can't wait to get him next to the other three mounts. 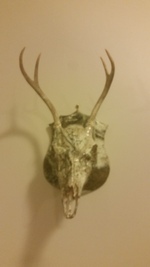 New trophy for my wall. I have heard they really don't like cameras, we don't really have any bears here in Ohio anymore except a couple that pass through every know and then. No mounts for me, I promised the wife this when I first started hunting. I am ok with it, as I am a meat hunter. I did see a beautiful yote today out hunting, a blondish coat, along with an albino squirrel. Oh and two young bucks which were fun to watch. I like the pose on the yote with the background you have! !